Home > Tip of the Day	> Arc Fault Circuit Breakers – they can prevent electrical fires! Arc Fault Circuit Breakers – they can prevent electrical fires! Electrical Tip of the Day: This is a re-post of some great information / explanation of the Arc Fault Circuit breaker from Tim Carters, “Ask the Builder” blog. Arc Fault breakers have been around for about 5 years but have not been something typically enforced by local code. Currently that is changing – and the 2008 NEC code does require their use for new construction. We suggest their use in a lot of older homes with questionable wiring as a quick and affordable means of fire protection and added peace of mind for the owner. DEAR LAURA: Your neighbor’s fire was just one of the 115 +/- electrical fires that happen each day in the USA. These fires cause hundreds of millions of dollars in damage, injure thousands of people and are responsible for the deaths of hundreds of people each year. I can see why you are terrified. Ask any firefighter and he will tell you that electrical fires are non-discriminatory. They can strike anywhere and at any time. The arc-fault breakers have a very important pigtail wire that gets connected to the neutral / ground bar in the panel. The white neutral wire of the circuit actually connects to a screw on the breaker. The electrical shorts that cause these fires produce arcs. These miniature fireworks create sparks and temperatures that approach 10,000 F. This intense heat can rapidly ignite plastic insulation, wood, carpeting or any other combustible material in the vicinity of the arcing wires. Arcs happen frequently in appliance electrical cords where insulation has become brittle or is cracked. Hidden wires behind walls nicked by nails or pinched by fasteners can also be sources of sinister arcing. Loose connections where wires are attached to switches and outlets are often arc hot spots. The traditional circuit breakers in your neighbor’s house did not prevent the fire for a simple reason. They are not designed to sense arc faults. Traditional circuit breakers are actually designed to protect just the wire behind the walls and the switches and outlets that they are connected to. The circuit breakers are designed to trip when they sense a short that causes an avalanche of electricity coursing through a circuit. They also will trip when a constant massive amount of electricity passing through the circuit causes a heat buildup within the breaker. Traditional breakers are not designed to protect lightweight appliance wires and extension cords that are plugged into wall outlets. Fire producing arcs can occur in wiring before traditional breakers react. Electrical manufacturers recognized this problem and decided to attempt to stop as many of these electrical fires as possible. The result of the hard work of many is a new arc fault circuit interrupter breaker. These devices work and act like a traditional circuit breaker except that they are smarter. Many of these new devices contain small filters and logic devices that allow them to sense an arc just as it is about to produce the sparks and intense heat. If arcing conditions are present, then the breaker trips instantaneously. Do not confuse these devices with the personal protection ground fault circuit interrupters (GFCI) that have been around for over 30 years. The GFCI circuit breakers, at the present time, do not have the capability to sense arcs. 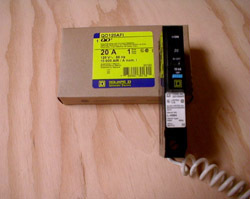 The new arc fault circuit breakers are identified in section 210-12 of the 1999 edition of the National Electric Code. Beginning January 1, 2002, they were required to protect branch circuits that serve residential bedrooms. These areas of the house have been identified as the source of many electrical arc related fires. The state of Vermont has taken a slightly more aggressive stance. They are requiring that these new life saving circuit breakers be used in all circuits that feed residential living areas. Their regulation went into effect on January 1, 2001. These new arc fault breakers can be purchased now in every state in the USA. These breakers are the same size as your existing traditional circuit breakers. The new arc fault breakers cost about $25 – $50 each depending upon manufacturer, but it is a very small price to pay for peace of mind. An experienced electrician can install a new arc fault breaker in a matter of minutes. It actually takes longer to remove and replace the cover to the circuit breaker panel than it does to switch out the breaker. How do you keep your digital files safe? What is Quality?